sun light = better photos. Hooray! Next week the tree guys will be out here grinding down the stumps. Then we’ll have our new fence built —can’t wait! We’ve been fenceless for several days now and it’s weird when there’s no barrier and people can look/walk in. Anyway, today’s recipe requires no introduction. It’s chocolate-y and it’s Nutella. Need I say more? Enjoy your weekend lovelies! Using a small cookie scoop (about 2 teaspoons) spoon the batter into each baking cup. Place an Oreo on top and then spoon in another scoop (2 teaspoons) evenly over the top. Bake for 12 minutes. Let the brownie bites cool for 5-7 minutes in the muffin pan before transferring them to the cooling rack. Clever! I love the Oreo center. WIll try. Oh you are evil! I am trying to be healthy at the moment and then you go and post these decadent looking treats and make me hungry 🙂 Seriously, these look AMAZING Anne. Oh dear me…this does not need introduction, you are right! Five ingredients! My family and I would be all over these; my son loves anything with oreos! We had a gigantic tree removed last year and it was the best move. So much more sun and less bugs! I love anything with Oreos too! Oh good lordy, do these look scrumptious! They wouldn’t last long in my house for sure. Great recipe, Anne! You can’t go wrong with oreos and nutella : ) Have a wonderful weekend Anne! I have a feeling these would be dangerous to have around. I don’t think I could eat just one! Nutella makes me absurdly happy as it is and then you added oreos. GENIUS move. Rich, so chocolatey! Simply YUM! I love this is just a few ingredients.. and then I can get these delicious bites! Amazing! I’ve had such a craving for deep fried Oreos, Anne. I suppose it’s a summer thing:) However, if you wish to tease me with the combination of Oreos & Nutella and call them brownie bites, my craving may just disappear! These look so great, and they sound so easy! I’m going to have to try this out very soon. Fantastic, Anne! Nutella with anything is always good but throwing Oreos into the mix puts these bites way over the top. And so easy to make, too! Oh wow Anne, these are the perfect fix for any chocoholic!! Anne I wish I had Here……..:)Nice week end too!!! 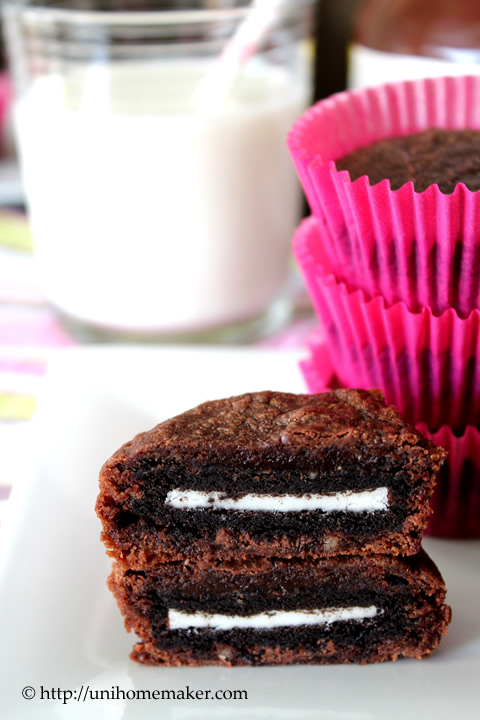 Brownies with Oreos surrounded in hot pink! What could be better! Just the thing to eat all day! Decadent! Oh my. What a fabulous treat! Brownie and Oreos? Yes, please! Pinned and sharing on Facebook tomorrow! Thanks Gloria for taking the time to comment. Wow. I think I’d be able to make an entire tray…..AND finish it off. Decadent weekend idea! hmmm….yummmm…this is such a great recipe. Everyone needs to thank the person who created nutella dont we? Oh good god. Heaven in a blog post. Too good!!!!! 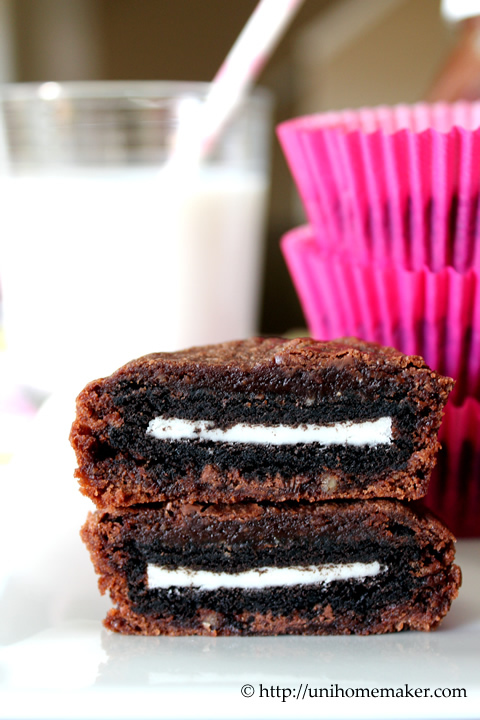 Love how simple these are to make…but still impressive with the Oreo in the middle! Yum! Oreos and Nutella!! Wow! These look super! You can never go wrong with Nutella! Great recipe – tons of flavors. But still easy to make – my favorite kind! Good stuff – thanks. Thank you John! And thanks for popping over. What yummy little brownie bites Ann! Perfect for sticking my newly discovered Newman O’s into! Hope you had a chance for some relaxation this weekend! Enjoy what’s left of it! so funny.. I just made something similar with oreos. your version looks so good. What, that’s it?!?!?! I’m in shocked with this easy recipe! I can make this for dessert while I wait for my kids to finish their meal (they are slow eater in the world…). LOVE THIS! 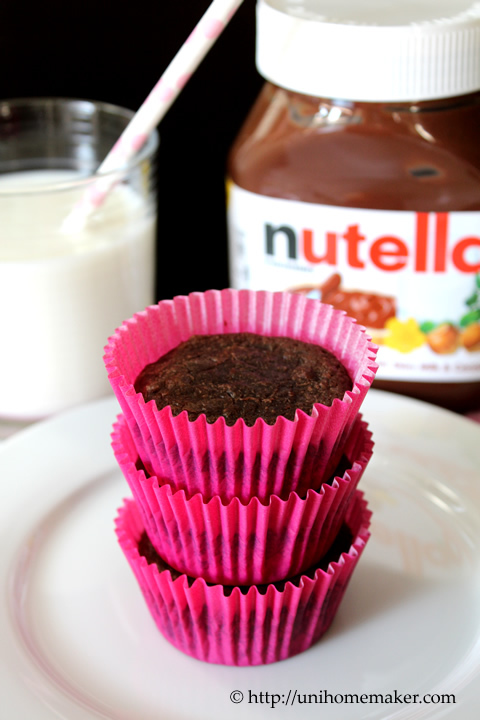 Oreo and Nutella… Even name of this recipe is yummy!